The average monthly income for someone who provided labor via one of the platforms was $533, representing a third of total income. The share of active participants earning 50% or more of their monthly income has fallen since the summer of 2014, as the total number making some money increased. The JPMorgan study provides a rare look at a little-researched part of the labor market. 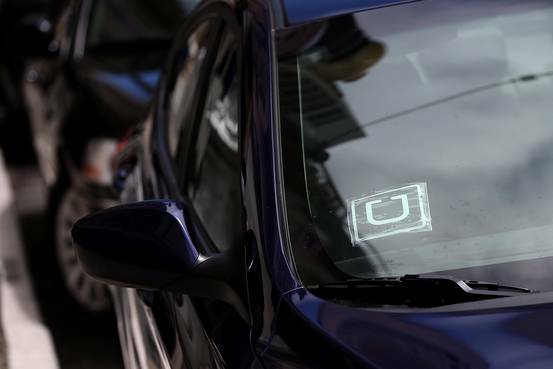 The government doesn’t specifically track participants in the sharing economy, though the administration did recently say it would measure contingent workers for the first time since 2005. The institute used an anonymized sample from JPMorgan’s 28 million customers to determine how many received payments from at least one of 30 online platforms. The study found that 4.2% of adults earned income from the sharing economy at some point during the three-year period examined. But the Uber driver, seemingly the face of the gig economy, was not the most common participant. More than 60% of income earners used their capital, including renting property or selling goods, to make money through online platforms. Those who sold their labor or services accounted for less than 40%, but their ranks are growing faster. Ab Emam began renting his family’s vacation home in Virginia’s Blue Ridge Mountains last summer on Airbnb. He has booked it 30 times since. The cabin is not a huge money maker, he said, but the rental income allowed him to replace the hardwood floors and pay for regular maintenance and cleaning, which makes the cabin more enjoyable when his family visits. The study found that only 19% of active capital sellers or renters earned a majority of their monthly income from online platforms. For active laborers, the rate is higher, 33%, but that share has fallen from above 40% in the middle of 2014. 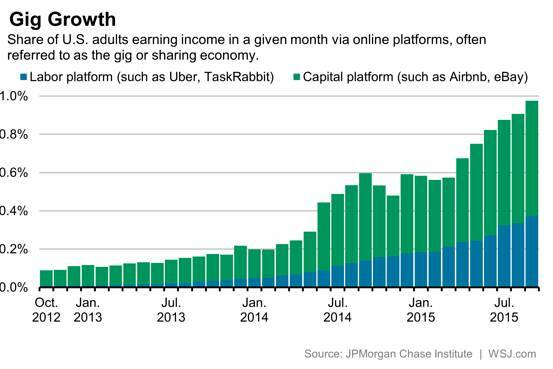 That trend suggests workers are “not deepening their reliance” on gigs even as the smartphone apps and websites that power the platforms become more prevalent, Ms. Farrell said. The slight decline in those relying on the sharing economy for the bulk of their income could indicate more workers are finding traditional jobs in a strengthening labor market. The study found that online platforms typically provided a modest boost to incomes. For renters and goods sellers, they earned about 7% more during months they participated. For laborers, the gig earnings helped offset a decline in other sources of income. That finding suggests the gig economy could hold the most promise for workers with irregular incomes. JPMorgan found that 70% of Americans ages 18 to 24, and 74% of those earning in the bottom 20% of incomes, experienced an average change in their month-to-month income of more than 30%. Such large swings can make it difficult to keep up with bills or rent, and can result in expensive borrowing or missed payments.